RadRichTextEditorRuler is a control providing ruler functionality to RadRichTextEditor. The rulers allow you to change the paragraph, page margins or align the paragraphs in the document. Rulers only apply to the Paged document layout mode of the RadRichtextEditor. 1. Drag and drop RadRichTextEditorRuler on the form. 2. Drag and drop RadRichTextEditor inside the RadRichTextEditorRuler..
3. 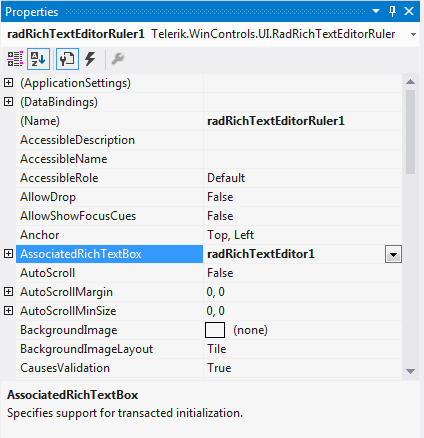 Set the AssociatedRichTextBox property in the properties window. 4. Set the LayoutMode of the RadRichTextEditor to Paged.